We are able to Develop, Manage and deploy any Windows-based or Web-based Application that supports sending & receiving SMS over different channels (SMPP, VPN Connectivity, HTTP Requests, Web Services…). Web SMS – an easy to use, straightforward, and powerful tool that facilitates the distribution of bulk SMS from an online source in a matter of minutes. 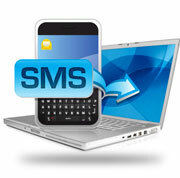 Two-Way SMS Messaging – an integrated interface for bidirectional SMS services that is easy to use. Incoming messages are routed to a target application via HTTP, FTP or SMPP protocols. As a result, your network interface can receive and process incoming messages according to your requirements. Full SMS Integration – a customized interface can be developed so that an existing legacy application can utilize SMS protocols (including all GSM operators in KSA). SMS Through GSM/EDGE Modem – A desktop application with full sending & receiving capabilities, integrated with a GSM/EDGE PCI Express modem.